Starting with the 1970 model year, Ford added a reverse lockout rod that prevents the key from being removed from the ignition without the transmission gear selector being in its parked position. Similarly, you can't move the shifter out of its parked position ("Reverse" with a manual transmission and "Park" with an automatic transmission) without having the key in the ignition and the ignition switch moved forward from the "lock" position. 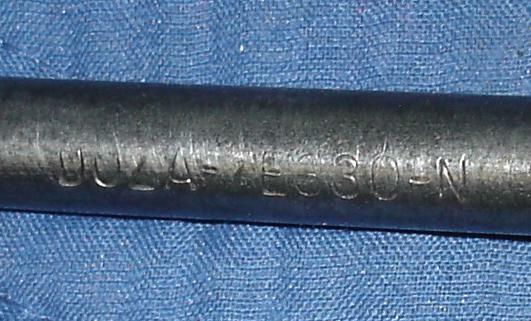 This rod is identified by basic part number 7E330. It attaches to the base of the steering column at one end (the end with the pin) and to the gear selector lever on the side of the transmission at the other end (the slotted end). The rod used with a manual transmission differs from the rod used with an automatic transmission. Here's a table that describes the part numbers and physical differences. OK, I know this looks confusing. The 1975 MPC lists the last engineering numbers shown above along with the first service part numbers. For example, it says that the D0ZZ-7E330-D rod is identified by the D0ZA-7E330-N engineering number. So what are all of the other service and engineering part numbers? An April 1970 Master Cross Reference List provides the other service and engineering part information. It looks like there might have been several revisions to this part during the model year. In general, you can ignore all but the first service part number. However, it looks like you might encounter any of the different engineering numbers in the field. If that's the case you should still be OK as long as you don't get the automatic and manual transmission types mixed up. Thanks to Bill Upham of Mansfield Restoration Parts and Larry Schwartz for the pictures used here.